Shippai Kinshi! Kanojo no Himitsu wa Morasanai! Light Novel Q&A – Please feel free to ask us any LightNovel’s questions! Honoka was feeling completely dejectedly as she laid prone on her desk. Even the red-purple cellphone was thrown aside. She intended to send Koremitsu messages a few times, only to delete them, and rewrite again. She leaned her face on the table, flailing her limbs. The instance she saw the upperclassman, the Moon Matriarch, latch herself bewitchingly onto Koremitsu with her snowy white arm, Honoka felt her head sizzle, all composure devoid from her. This Moon Matriarch, Tsuyako Udate, was of nobility similar to Aoi, and was a famous person, having appeared in a magazine interview as a shining rookie in the Japanese Dance circle. She had silky red hair, a glamorous face, and an alluring body. Her still presence alone would attract the stares of those surrounding her. If 100 people were taken for a questionnaire, at least 99 of them would call her an absolute beauty. There were all sorts of pretty girls amongst the normal high school students, like Honoka. Some of them are a little pretty, some are barely called pretty, and some are beauties who can only look pretty are dolling up. Tsuyako was not this case however, she was a certified, superstar level of a beauty. “I am a little attracted to a certain guy in my class, but a super-cute princess asked him to be her boyfriend. What do I do? Normally, Honoka would post her sweet cellphone novels using her online avatar, the Purple Princess, and even settle some girls’ love troubles. She immediately got up, and hurriedly tapped on the cellphone, her heart practically clutching at straws. “There’s a super beauty being too close with a guy I have a crush on. What do I do with him in the future? Soon after sending the message, Honoka’s face was flushed red. “WHAT AM I DOING HERE!!? “I’m not supposed to be such an annoying bimbo!! I’m supposed to be the love expert, the Purple Princess! The reliable and friendly big sister!! What’s with this Hono Hono!! Perhaps she should not think about Koremitsu again. Right, why was she concerned with that cheater of a man? She had assumed that he was fully devoted to Aoi, but hooked himself up with a hikkikomori, had a scandal with an elementary school girl, and this time, got a beautiful upperclassman. Though Tsuyako Udate was famous, her reputation however was bad. Soon after she entered the elementary school branch from the kindergarten, she was transferred to a girls school of nobility in England, and only returned to Japan suddenly soon after her 1st year in High School. There were gossips that she was expelled because she had a scandal with a boy, and there were also rumors that she was unabashedly meeting Lord Hikaru in the Japanese Dance clubroom. Some even said that if she had a fancy in a man, she would lure him in, and dump him when she had enough…the way she dumped others was as vicious as that of stabbing someone in the heart with a smile. 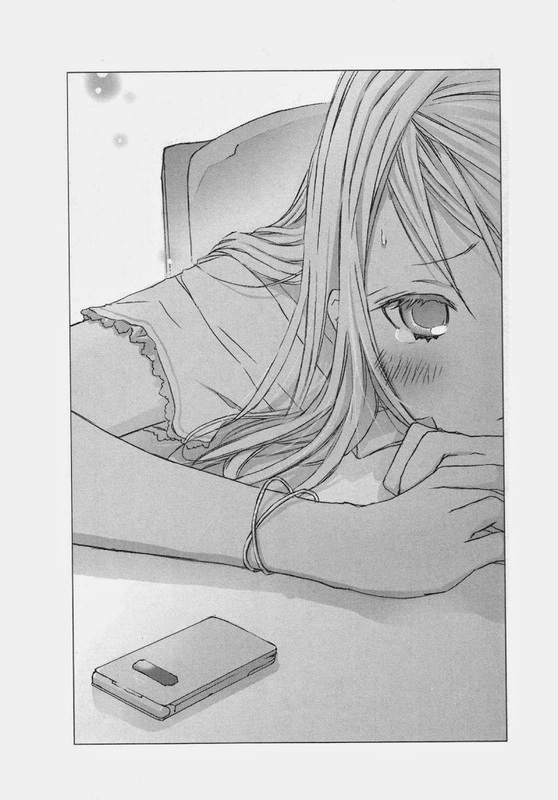 The next morning, Honoka continued to sit at her place, looking melancholic as she held onto her cellphone tightly. At this moment, Koremitsu walked in from the back door, his back slouched like usual. Michiru hurried back to her own seat, and Honoka was tensely listening to his footsteps, cold like his voice, her heart pounding wildly. The footsteps stopped beside her, and the sounds of the bag being thrown onto the table and the chair being dragged out could be heard. Honoka’s heart was pounding madly, almost popping out from her mouth. She leans over as she says this, and Koremitsu looks panicky, his face completely red. Honoka screamed in her heart, and at that moment. Koremitsu, who was supposed seated beside her, was standing beside her this time, shocking her. He placed the lunchbox she threw the previous day on the table. He sounded and looked really unhappy. Of course, it was natural for him to be angry. However, Honoka’s words were full of spite. However, Honoka could not stop. Honoka felt bitterness in her mouth. Her throat was in agony, as if it was suffocated. She did not want to say such vexing things. She did not want Koremitsu to see herself in such a putrid state. She tried her best to eke out a voice. Honoka felt her heart freeze. She knew that Koremitsu never treated her as a girl, but she hoped to be at least someone he could trust and talk with, a classmate. Her legs felt limp, and she felt an urge to cry, furious at this blockhead of a guy who did not understand her feelings at all. The instant these words came out, she was dumbfounded. Koremitsu’s mouth was agape, absolutely speechless. The classmates greeting each other went quiet, her good friend, the braided bespectacled girl, was covering her mouth with both hands, looking astounded. The class was completely quiet. Honoka was so abashed her face was sizzling. She had always played the role of the ‘cool and reliable Miss Shikibu. But the image she worked so hard to cultivate was gradually breaking down. A giggle could be heard from nearby. Tsuyako was standing at the back door. Her glossy red hair was draped upon her voluptuous breasts, the tail swaying gently by the waist. Koremitsu frowned, probably feeling awkward about this. Upon seeing this, Honoka’s heart sank further. Club practice? What’s that about? Did Akagi join the Japanese Dance Club? For the Moon Matriarch? Honoka watched Tsuyako carefully, and found her outstandingly beautiful, her breasts something Honoka could not compare to. Tsuyako then turned to Honoka. With his back slouched, Koremitsu was seated cross-legged in a corner of the tatamis. Tsuyako was in the middle of the classroom, dressed in a red-collared blue kimono with a red sash around her, dancing elegantly with a red fan; Honoka and the class representative with braids were gaping from the side, mesmerized. A few days ago, Honoka was frowning, saying, “She’s famous, but there’re bad rumors about her”. Once Koremitsu heard her say these words she typically would not say, he could not help but refute her, and Honoka’s loud declaration reverberated throughout the class…the situation was shambolic. Tsuyako invited her, and she went to the clubroom with her mouth pouted, the atmosphere claudicant. Once Tsuyako opened her crimson fan and started dancing, Honoka was enthralled by it all, watching with her mouth opened. Once Tsuyako finished dancing, Honoka seemed to have snapped out of a trance as her shoulders jerked, turning her face away unhappily. Once Tsuyako spoke to her however, her face would turn red, flustered by this. At that moment, Koremitsu realized that something was amiss. At this point, Honoka had become a devout fan of Tsuyako, and would often drag the class representative in braids to the clubroom. Tsuyako smiled as she closed the fan, and both of them started clapping passionately, running to her. Both Honoka and the class representative sounded really excited, and their smiles became more pronounced whenever Tsuyako smiled. Both of them cheered and squealed as they flailed about. Shikibu, isn’t your attitude completely different now? She always looked cold and aloof in front of Koremitsu, but became so chatty and noisy at this point. Though he had known that girls were temperamental like the weather, he was so amazed by this drastic change he had personally witnessed that he was unable to feel angry at all. Koremitsu was worried when Tsuyako invited Honoka, wondering what would happen. He was flabbergasted to find out however that they got on so amicably. Till this day, the stalker Tsuyako spoke of had yet to appear, and she had been living quite the pleasant life every single day. She said she was troubled, that she did not know what to do, that if she were to keep this up, perhaps the flowers Hikaru so treasured would be wrecked, and requested him to watch over her. Was that simply an excuse for him to join the Japanese Dance club? Koremitsu again turned to look at his friend. Hikaru sat quietly, his leg still raised, maintaining this position even when Tsuyako danced, watching blissfully as his eyes narrowed. The deep gaze was ostensibly loving every single move the hands made, every single twist her neck did whenever she danced, wanting to embrace her in his clutches. On the way home after his date with Tsuyako in the school, Koremitsu and Hikaru were walking down the dirt path under the sunset. –What’s your promise with that upperclassman? Koremitsu recalled the question he asked Hikaru before. Hikaru’s shoulders shuddered, looking gloomy. –When Tsuyako dances on stage next time, I will definitely be in the stands, applauding her more than anyone else. The thin strands of hair draped upon the pale cheeks swayed weakly, the neck and shoulders slumped feebly. The grass lying by the roadside swayed forlornly, seemingly reflecting Hikaru’s feelings. Koremitsu’s voice too became hoarse. –Well…you can’t do that now. You’re dead. –What do we do, indeed…? Neither of them spoke after that. Hikaru often said that Tsuyako’s dance was unique. He promised that whenever she got on stage to dance, he would be in the audience marveling at her. Those definitely were his sincere thoughts. But this promise would never be fulfilled. Even Koremitsu would not be able to fulfill this for him. Tsuyako should be hoping for Hikaru to watch her perform personally. It was meaningless for others to take over. Koremitsu harbored bitter feelings as he asked quietly. Tsuyako, Honoka and Michiru were chatting happily, and as Hikaru watched over them gently, his expression seemed so fragile. Tsuyako seemed to be guiding the duo on their dance movements as she stood beside Michiru, sometimes raising the latter by the arm, sometimes turning her neck, causing Michiru to blush as she followed suit. At this moment, Hikaru spoke gently with a warm yet forlorn voice. The prayerful tone stabbed Koremitsu’s heart. What he and Hikaru could only do was the pray. Tsuyako was probably strong enough to accept that the promise could not be fulfilled. If Tsuyako really hoped for it, Koremitsu could accompany her to the clubroom everyday after school, until the day she could let go. He was instead happy that he had someone he could call ‘senpai’, and that he had a place for himself. Such a notion was too embarrassing, so he never said this to Hikaru. At this moment, Honoka walked towards Koremitsu, and sat beside him silently. Koremitsu was tense all over. Tsuyako was still guiding Michiru on the latter’s dancing, and the latter was embraced from behind, her braids swaying frantically. Koremitsu spoke as per Hikaru’s opinion. Honoka placed her hands on her cheeks, looking flustered. Her refreshed expression was practically bleached through, showing nary a tint of spite as she seemed to sincerely think so. “What do you mean by that! ?” Koremitsu grumbled. Upon eavesdropping on their conversation, Hikaru chuckled. Both of them turned around, and found that Tsuyako and Michiru were already in front of them, watching. Tsuyako leaned her body forward, giving a teasing smile like a big sister. Michiru’s eyes widened beneath the glasses, looking really panicky. Honoka’s face went beetroot as she exclaimed. Honoka’s eyes widened, unable to say anything. Honoka’s face was completely red as Tsuyako beamed. The earnest, innocent smile was exactly the same as Hikaru’s as he floated beside Koremitsu, smiling. Are lovers similar even in this? Or perhaps it was because they were similar in this aspect that they got on well with each other? Well, never mind. Hikaru has as many lovers as there are flowers. There’s nothing worth thinking about it. At this moment, the door to the classroom was opened. There was a person with black flowing hair standing outside, a white ribbon tied upon it. Koremitsu was thunderstruck within once he said the delicate princess standing outside. Aoi’s stare was hovering about, looking timid. Once she saw Koremitsu however, her expression eased somewhat as she seemed relieved. Right beside Koremitsu was Honoka, whose shoulders quivered slightly, looking tense. Aoi bowed deeply, her flowing black hair swaying along with her gesture. However, once she lifted that pixie face of hers, she clearly looked tense. 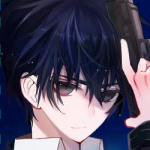 With a harsh look, she glared behind Koremitsu. He turned around, and found Tsuyako walking towards them, her expression as tense as Aoi’s. Hikaru sighed once he saw this, and could only cover his face with a hand reluctantly. Her eyes and lips were smiling, but she did not look like she was; even her voice sounded stern. Aoi remained silent as she scowled back; it seemed she was unwilling to greet the other party. Suddenly, Aoi’s face was flushed with anger. Koremitsu was stunned, for such words were not something one would simply say so carelessly. Honoka and Michiru too were stunned. Aoi clenched her hands, her petite body shuddering as she took a deep breath to rein in her furor. She then turned away to leave. Hikaru looked lethargic as he broke into a frown. Koremitsu grabbed his bag and gave chase. As he went by Honoka, he noticed her biting her lips in a lonely manner. Having patched up after much difficulty, would she throw a tantrum again? Koremitsu was perplexed by that, but he had to first handle Aoi’s business. Tsuyako stood at the door with a mature expression, waving her hand silently. Koremitsu was in a dilemma once he heard her say this tearily. Thinking about it carefully, Aoi was betrothed, and yet Tsuyako had an affair with Hikaru, unabashedly proclaiming herself to be his mistress. Naturally, Aoi would not have tolerated it if Tsuyako had been like this when Hikaru was alive. Koremitsu turned over to Hikaru, and found the latter putting his hands together, looking apologetic. From what Hikaru himself and others had said, Koremitsu already knew that Hikaru was a harem prince without restraint. However, he found out that Hikaru never did anything to Yū, never dared to kiss Aoi, his fiancee, for fear of annoying, and was akin to a bumbling father to the elementary school girl Shioriko. Because of these, his opinion of Hikaru changed slightly, that perhaps it was a misunderstanding that Hikaru was assumed to be someone without restraint, that he was a decent person. Koremitsu’s veins were bulging as he gritted his teeth, his eyebrows raised at Hikaru. Koremitsu’s blazing fury was not to be denied. Her declaration and expression seemed to have broken Hikaru’s heart, for whenever she spoke, the latter could only groan. 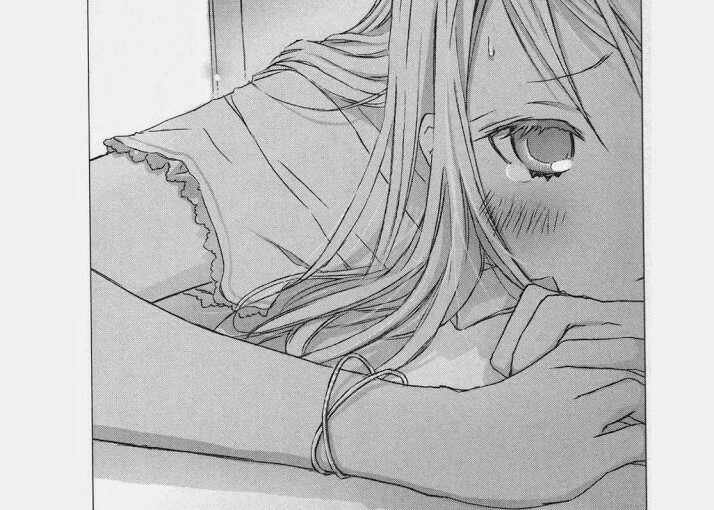 Aoi looked very agitated, and once she spoke till her, she suddenly stopped. It seemed she suddenly recalled the term ‘being abashed’ as her eyebrows dropped slightly, her expression fragile. Aoi covered her face with her hands as she turned around. The only one Koremitsu could plead for help to had already retreated out of the overt sense of guilt. It was because of this person that such a scenario occurred; naturally, Koremitsu could not ask him, and did not want to anyway. Aoi turned around in shock. Her eyes widened, her mouth slightly ajar. And a stupefied voice could be heard. Hikaru too was gobsmacked to a point of breaking out from his funk. But those were his true thoughts. He knew Hikaru had his own troubles, that Hikaru truly loved every single flower, every single girl. He also knew that Hikaru lingered on Earth to fulfill the promises he made to all the girls. But even so…he could not accept how Hikaru dated so many girls at the same time, and he was committed to dating only one girl. Koremitsu seemed to be infected by her abashedness, and both of them remained silent, looking down awkward for quite a while. The pair walked to the bus stop 3 stops away from the one Aoi usually boarded. Aoi walked slowly, and Koremitsu had to cautiously slow himself down to match her pace. Hikaru looked as lethargic as ever as he followed behind them, his shoulders slumped. He looked as gloomy as a ghost (though he was one), “I am hated”, and would occasionally say such things that would unnerve even Koremitsu. He then boarded the bus along with Aoi, and sent her home. Clearly, he was affected by everything that had transpired. It was sunset, and Honoka was tapping at her cellphone, furious as she walked down the street. I’m the Cinnamon Roll who talked to you about T from the handball club I belong to. Thanks to your suggestion, my relationship with him has improved, and now we’re going home together after club activities. Currently, we’re just good friends in the club, but I want to confess during the summer camp. Recently though, there has been a girl sketching in a corner of the school. That girl looks very demure like a princess, and is very cute. The male members are all excited, saying that the girl was looking at themselves. T seems to be attracted to her, and even told me ‘what do I do if she suddenly confesses to me’. Does that mean I have no hope now? Honoka quickly tapped at the keys, replying to the questions flooding her message board. It’s already a great improvement that you’re able to go home together with T! I know you’re worried about the girl who keeps sketching, but guys always admire those beautiful girls who are hard to attain. Don’t worry! T will choose you to be with him in the end, a cute girl who has the same interests as him–that’s you, Cinnamon Roll! The most important thing is to say it carelessly though! T’s heart will race because of that! Once she sent this message, Honoka felt an aching in her heart. She was so shocked when she saw Aoi at the Japanese Dance clubroom that she forgot to breathe. Aoi looked around the clubroom uneasily, and the way she smiled once she found him was really adorable. She was Lord Hikaru’s fiancee, dubbed as Her Highness, and was truly a Princess amongst the many nobles in the school. She had a pure, adorable look, but it was because of her purity that others found it difficult to approach her. She never expected Aoi to show such a relieved, gentle expression. It was really unexpected to hear her say such words about Tsuyako, but on a second thought, it was definitely reasonable. Aoi was once Hikaru’s fiancee, and Tsuyako unabashedly proclaimed herself to be Hikaru’s lover; naturally, Aoi would not be on good terms with her. After Aoi stormed out of the room, Koremitsu hurried after her without looking at Honoka. Honoka’s thoughts became more pessimistic, and she slapped herself on the face. At this moment, her cellphone rang. Once she saw the caller, she felt angrier. Honoka’s tone was not welcoming in the slightest, but the caller who annoyed her did not mind. Honoka actually intended to hang up on the phone once she heard that rapid-fire teasing. excited for this, thank you for your hard work! he probably meant her classmates. “his” or “her”; either is fine since it references to both honoka’s and akagi’s classmates. Oh my oh my does it mean she will get a job at the party!! Oh the excitement! looks like it, i hope asai goes too. that would be hilarious! My body is ready for the love warfar! mine is not =( can’t wait! Thank you for hard work. That means Honoka will appear at the party, right? right? I cant wait to see what will she do when she meets Akagi with Aoi. Let me guess, HIINA will invite HONOKA to go AOI’s party for some scoop. AKAGI you can’t escape your romantic comedy. Hahaha!